Short Review: The first two chapters are ideal for beginners, with Saulo helpfully breaking down defence into survival and escapes. He methodically details how to work your way free, as well as common misconceptions. Coverage of guard fundamentals is also good, with simple sweeps and submissions again described alongside typical problems. Large, well-spaced pictures provide clear instruction, further aided by the demonstrators wearing a blue and a white gi respectively. The considerable array of different guard variations is a little overwhelming, especially in the huge chapter on passing the guard, but the material is nevertheless good, in particular the simpler opening section detailing the basics with concise and helpful description. I was very pleased to see the approach Saulo took in his final chapter on submissions, where he emphasises essential concepts like tapping before injury, treating class as learning not 'winning' or 'losing' and accepting that you will eventually find yourself tapping to lower belts. The submissions themselves are all straightforward, accompanied by Saulo's trademark clarity of explanation. It's an excellent book, which will be of benefit to anyone looking to improve their BJJ. I wouldn't recommend it as the first book you buy, as it would be easy to get bogged down by the sheer amount of technique on display, but its definitely an instructional you should have in your library. Available to buy here. Full Review: This book has been getting rave reviews on the internet even before it was officially released. As many of the people writing were particularly enthusiastic about its applicability to beginners, I was very keen to take a look, finally picking it up earlier this month. Saulo's teaching style is perfect for a book: as can be seen on Jiu Jitsu Revolution, he loves to talk. That tendency towards extended discussion translates well to the written medium, where has a chance to really go into detail. It is also a little clearer, as the words are filtered through Kevin Howell and the rest of the editing team, so Saulo's trademark Brazilian English has been cleaned up for grammar. In the introduction, Saulo has lots of points to make, with sensible comments about controlling the ego. I don't agree with him that the journey from white to blue is the most important, but then I can only judge that as a blue myself. I would have thought that blue to purple is far more momentous, though its difficult to make any absolute statements about rank in a style which lacks any kind of standardised promotion system. The organisation unfortunately follows in the footsteps of Renzo and Royler's Theory and Technique, with sections divided by belt level. Fortunately Saulo isn't quite so haphazard as the earlier work, especially in the well organised white and blue belt chapters. While using belt ranks as a basis for structure makes little sense in a sport as non-standardised as BJJ, it doesn't significantly detract from the book's usefulness. Saulo states that the focus of a white belt should be survival. It is not about technique or even getting the escapes right at this point, but simply getting into a solid defensive position. As he will do throughout the book, Saulo also shows what not to do, which is immensely useful but unfortunately absent from many books and DVDs. Ed Beneville does a good job of it in his earlier work, which is perhaps where Saulo got the idea from. The manner in which Jiu-Jitsu University spaces out the full-colour pictures is another point in its favour. Beneville's work is fantastic, but can sometimes feel a little cramped due to how much he squeezes onto each page. On the other hand, Saulo's book is rather large as a result: there are benefits to either approach. In those pictures, Saulo also makes certain that one person is wearing a blue gi while the other wears white. This is a small but essential detail missed by books like Theory and Technique: the colour distinction makes equating the text to the illustration far easier for the reader. Getting to side control survival on page thirty-five, the links to the Jiu Jitsu Revolution DVD are clear, a frequent occurrence in the book. Saulo runs through the survival position, then explores what he calls common misconceptions. Interestingly, some of these contradict other instructors, such as the outside underhook on page forty-one. This is exactly how Gustavo Machado escapes side control on his Great Escapes DVD. Saulo calls it "a more advanced misconception," because "if you break this move down it makes sense." The problem, according to Saulo, is if you attempt to get into this position but forget to block the cross-face. As the pictures demonstrate, that could lead to getting caught in a kimura. Page fifty marks the next section, escapes, which Saulo attributes to the blue belt level. I very much like that on the facing page he has a picture of female athletes: hardly any instructionals acknowledge that there are in fact women who practice BJJ as well as men, which is a problem. Hopefully small steps like the one Saulo takes here (and much larger steps, like his strong support of female athletes in his San Diego school) will help tackled the male bias. As Saulo puts it, "the escape always stems from your ability to survive." I like the way that he breaks down defence into these two parts, beginning with the posture, then the technique. I also like the use of multiple angles: like Beneville, Saulo generally shows two angles for each technique, such as escaping the back on page fifty three (which is exactly the same as Jiu Jitsu Revolution). I'm not sure I entirely agree, but then I'm not a high-level competitor, just a mediocre blue belt. I would have liked to have seen detailed coverage of the upa too, but along with the above reasoning, it may have also be a matter of space. To take another positive, Saulo includes drills for specific sections, helping posture and movement. For example, Saulo shows a solo drill for both recovering guard from side control and also going to your knees. This is an excellent idea, especially for an instructional volume you're probably going to be reading at home. Rather than having to wait until class to put what you've read into practice, material like this gives you something to practice in your living room. As well as positional escapes, Saulo also looks into submissions, covering armbars, triangles and guillotines. While this is generally of a similarly high level as everything else up to this point, I did have two questions when reading the material. First, Saulo dismissed grabbing the knee and driving it to the mat as an effective tactic to escape the triangle; I had always thought it was one of the fundamentals ways to get free. I can see his reasoning, however, built on the fact that legs are stronger than arms. Second, and more glaring, is that he includes footlocks and the kimura from half-guard, but not the far more common kimura from full guard. On top of that, there is no mention of the Americana or the cross-choke, which you're also bound to encounter regularly during sparring, from both a defensive and offensive perspective. Those minor points aside, the opening two chapters of the book are excellent, with a wealth of superb material for beginners. This is definitely something all white and blue belts could benefit from, and the focus on defence rather than offence is also excellent. gives you the sensation that you are safe. So insecure people usually maintain the Closed Guard at all costs, thinking, "Why take the risk of being passed?" Well, life is about taking risks. You have to jump for higher goals rather than just staying safe. While you feel this false sense of security, you are not progressing. That makes a certain amount of sense, as just clinging on to closed guard with all your strength gets dull fast. I think you need to be comfortable with closed before open guard, but then Saulo doesn't appear to be disagreeing. As he says, "the Closed Guard is certainly effective," but the problem is "it gives you a limited world in which to work." With any kind of submission or sweep, you are almost always going to have to open your guard at some point during the attempt. Saulo moves through several options involving over and underhooks, along with taking the back, which I hadn't expected to encounter at the start of the section. Saulo gets back to basics after the initial few pages, with scissor sweeps, basic armbars and cross-chokes...then goes to a Brabo choke. Again, that seems a little out of place in the opening section, but it is immediately followed by a basic triangle, sit-up sweep and flower sweep. If your partner stands up in your guard, there are numerous sweeps available, which Saulo discusses next. These are all solid fundamental techniques, like the handstand sweep, which combines well with the star sweep. I was paying particular attention here, as I'm always going for that (so far without success). The misconceptions part was therefore especially handy, where Saulo warns against forgetting to control your opponent, bulldozing forward and stalling. The comparison to Beneville is strong after that, as Saulo covers off various ways to defend against specific guard passages, reminiscent of Beneville's Strategic Guard. Having been relatively basic up until that point, the book suddenly erupts into a bewildering array of guards: butterfly, spider, cross-grip, De La Riva, sit-up, reverse De La Riva and half-guard. The majority of the positions follow a similar pattern: notes on posture, possibly with a solo drill, followed by a sweep, then finishing with common misconceptions. At times that can make the section on guard feel like an overview, so it might have worked better if perhaps the book had been split into several volumes, with this first release looking purely at the basics. On the other hand, Saulo has tried to be comprehensive, and does a fairly good job of not getting too complicated. His concentration on sweeps rather than submissions is a definite plus point (they aren't completely absent, but its rare), particularly when catering to beginners. I also liked the snippets of historical detail. For example, the section on De La Riva explains how Ricardo De La Riva developed many of the sweeps and attacks for this position, beginning in 1981. Saulo also often refers to contemporary stars of competition, like Roger Gracie, Rafael Lovato Jr and his own brother, Xande. Lovato gets a little box entitled 'case study', but strangely, he is apparently number three, with Helio providing number one. Unless I've misread, there doesn't appear to be a second case study in-between the two. The Half Guard is a great guard for people who are neither flexible nor athletic. It is not a purely offensive guard. The best kind of guard is one that combines submission attempts with escapes, survival, and sweeps. This is where you really want to be. The Half Guard does not have many high-percentage submissions, and it is mostly for reversing or sometimes stalling. However, it is a guard that is necessary, and I believe you need every type of guard position to cover all possible situations. That isn't what you'd call a glowing recommendation: in short, this quote seems to be saying that if you're inflexible and unathletic, half guard is a necessary evil that can help you stall. I have to admit that this is a pretty accurate depiction of how I tend to use half guard, so I was pleased to see Saulo follow up with a method of recovering full guard. As ever, he also goes into detail on what not to do, before moving on to deep half guard and taking the back. Guard passing is grouped under brown belt. Like the previous chapter it also includes lots of different types of guard, but here Saulo goes into a little more depth, especially on open, butterfly and half guard. 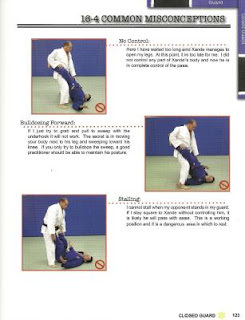 This chapter also includes the best part of the previous purple belt section, which is the coverage of fundamentals in the opening few pages. A few pages later, Saulo revisits Rorion's infamous 'Gracie Gift', first seen on Gracie Jiu Jitsu Basics. Saulo acknowledges that "some think this move is too antiquated to be useful and others complain that this technique is a sure-fire way to get triangle choked." However, he argues that "if done correctly, your opponent will be unable to prevent the opening or triangle-choke you." The key element is not putting their leg up on your shoulder, as Rorion demonstrates. Instead, Saulo underhooks with his hand on top of his knee. It still looks a little risky, but certainly safer than Rorion's suicidal version, where the Gracie patriarch never even mentioned the possibility of getting triangled. Passing from standing receives an equally detailed explanation from Saulo, with more drills, pointers, variations and examples of mistakes. That same treatment goes for open, butterfly and half guard, with briefer segments on X-guard, De La Riva, inverted guard, spider guard and reverse De La Riva. The section on guard passing is massive, spanning one hundred and thirty-three pages, by far the largest in the book. It is followed by a 'black belt' chapter of less than fifty pages, covering submissions. Saulo's ethos here is excellent, starting with the organisation: submissions are left right until the end of the book, having first established the defensive tactics of escapes and sweeps. I always have been a competitive person, but I have also had to check my ego. I have had to remind myself that I am at the academy to learn and not to compete. The time to compete always comes, and the academy is rarely the place for this. When I train, I tap to lower belts from time to time. Everyone does. The important part is bringing your students with you, not fighting them to keep your superiority. If you do not help them, you will never create the image of yourself in your students. Samurai are not the historical figures which spring to my mind when thinking of people without ego looking to help their juniors, but then I'm no military historian. It is an important message either way, as is Saulo's next point that "it is better to tap many times, train hard, and have a safe learning experience than not to tap once and suffer injury and time away from the mats." Eminently sensible, and essential advice for everyone involved in BJJ. The submissions themselves are simple and functional, all either chokes or arm attacks from one of three positions, mount, rear mount or side control. The only exception is a straight ankle lock right at the end, shown from within someone else's guard. That isn't something I would expect to be included in a book aimed at beginners, but Saulo does preface his demonstration with the advice to "not utilize this move in lieu of learning proper guard-passing skills," one of the pitfalls of focusing on leg attacks. Jiu Jitsu University is a polished piece of work, giving the BJJ student everything they need to know to progress in the sport (though you could argue takedowns aren't present, that part of grappling is - and has always been – far better explained by judo and wrestling instructionals). This is without a doubt worthy of inclusion in your grappling library. Update May 2013: The Ribeiro brothers now have an online instructional site where there are videos of every technique from Jiu Jitsu University, among numerous other features. So, if you're a fan of the book, you may want to take a look at BJJ Library (my review here). For the absolute beginner, I would still recommend Mastering Jujitsu as your first purchase, as the enormous number of techniques in Jiu Jitsu University could be a little much for somebody new to take in. If I was suggesting order of purchase, this would probably come in at number three, after Mastering Jujitsu and Ed Beneville's The Guard, along with at least several months of mat time. Available to buy here. Fantastic and comprehensive write up - I'm certainly gonna buy this book. I've only just started BJJ and will have to travel once a month to get to a class and would like a good book to keep my mind sharp. The Saulo quotes were great! They definitely resonated with me. This is a great book not only because of the number of techniques that are in it but also because of the insights Saulo gives. I recommend that all BJJ Practicioners have a copy of this book. Interesting review! I was recommended this book by my brown belt of a boyfriend (who has neither of the two others books you advise). According to him, getting from blue to purple is indeed usually harder for BJJ practitioners; on the other hand, he considers the blue belt as the sign that you are definitely into BJJ and unlikely to give up, so I guess that is also an essential step. I'd disagree with your female teammate, but I've heard that too. A number of people recommend using pain compliance to help against larger opponents, but I would much rather know that my technique worked because I did it correctly, not because I was digging my knuckles into their collarbone or something like that.